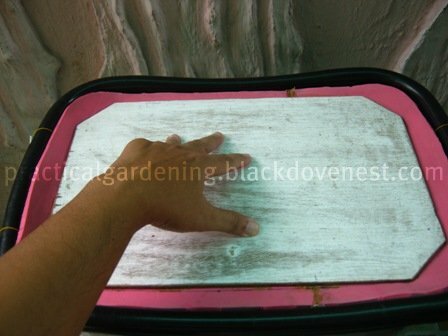 The first part of this article discussed some background on how to make a homemade worm bin setup. Also discussed were the components of the worm bin setup. Finally, how-to instructions were provided for making the worm bit feeding tray. 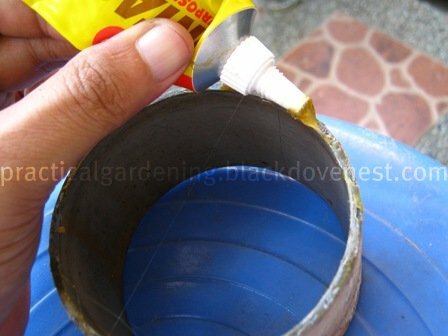 In this article the how-to instructions for making the rest of the components of the worm bin setup will be discussed. Mark areas inside the drain tray's bottom where you intend to attach the drain tray spacers. Ideally, this would be near the four corners of the drain tray. 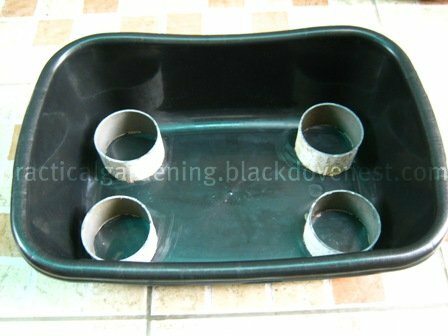 The 4 spacers create a 2-inch high gap between the outside bottom of the lowest feeding tray and the inside bottom of the drain tray. The 2-inch clearance space allows the draining and collection of vemicompost leachate, sometimes referred to as worm tea. Smear liberal amounts of construction adhesive on one end of the spacers as shown below. 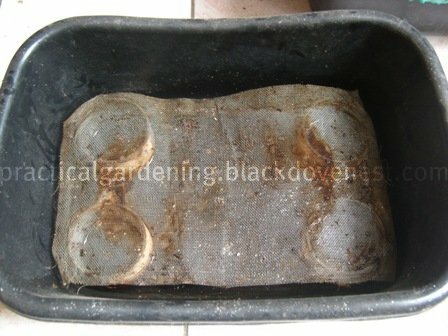 Remember the spacers will partially be submerged in vermicompost leachate most of the time. So it's important that the construction adhesive creates a bond that's strong and durable enough. Carefully position and press on the glued edge of the 4 spacers against the inside bottom of the drain tray. 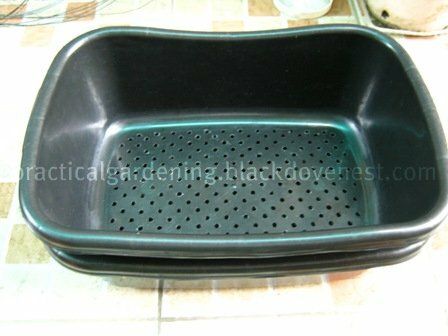 The drain tray with the glued spacers is shown below. Finally, place a piece of window screen on top of the spacers. All the feeding trays have 5/16" bottom drill holes that are big enough for the composting worms to fall through the drain tray. Here's the bottom feeding tray stacked on top of the drain tray's spacers. The window screen is in between the bottom of the feeding tray and the top of the spacers. With a pair of scissors, cut a rectangular piece of nylon net that is 6 inches wider and 6 inches longer than the Feeding Tray's width and length. So if the Feeding Tray's top surface area is 12 inches wide and 17 inches long, then the net is 18 inches wide and 23 inches long. Wrap a length of garter around the Feeding Tray's top lip so it is tight. Cut the piece of garter that was wrapped and join the ends by tying them together. Fold the edges of the nylon net around the garter and sew it using a needle and nylon thread. Use a running stitch along the straight edges and a backstitch at the corners. The finished product should look like the one below. 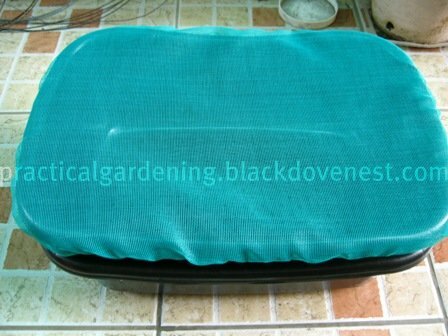 The gartered edge of the nylon net goes over lip of the top Feeding Tray. 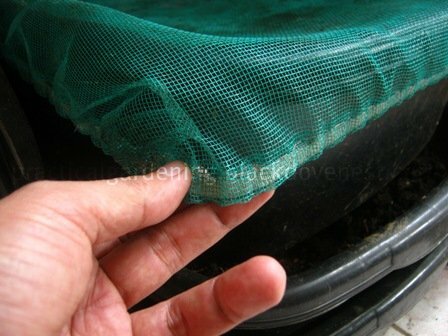 Notice how snug the gartered edge is when a corner of the nylon net is lifted from a corner of the top Feeding Tray. 1/4" thick Plywood, 10" x 15", with cut corners - 1 pc. 1/2" thick Carpet tiles (foam or pva), 12" x 17" with rounded corners - 1pc. Nylon String, 14" long - 2 pcs. Cable Insulation, 6" long - 2pcs. Screws, 1/4" long - 4 pcs. Glue the plywood piece on the carpet tile piece (colored pink) as shown below. Together, these two will form the sealing lid. When pressed down on the inside of the feeding tray, the carpet tiles' edges seals the opening. To allow you to pull out the sealing lid from the feeding tray, you need handles on both sides. 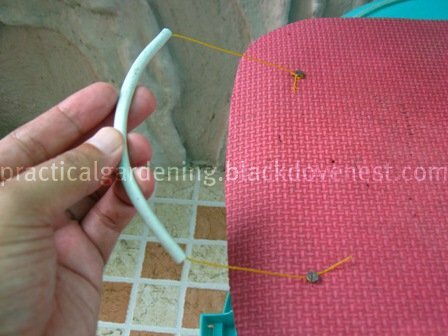 Pass the nylon string inside the cable insulation. Affix two screws on the sealing lid and tie both ends of the nylon string on the two screws as shown below. Do the same for the other end of the sealing lid. 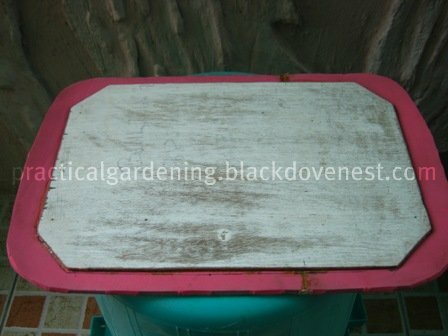 Press down the sealing lid on one of the feeding trays as shown below. Pressing it down further inside the tray will create a tighter seal. 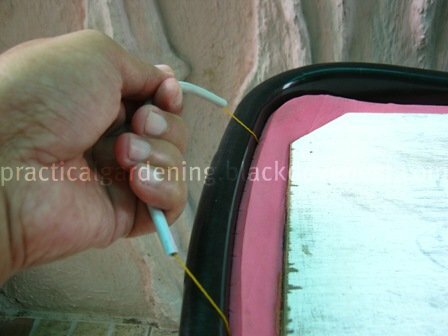 The handles will allow you to easily break the seal of the sealing lid and then pull it out as shown below.